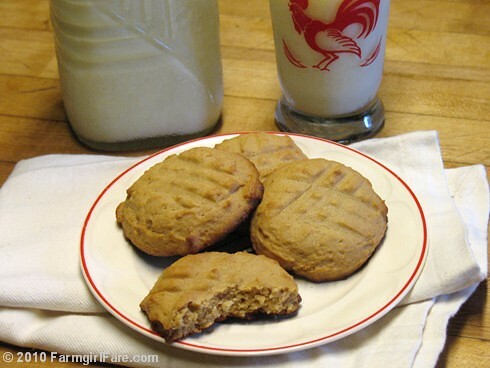 These soft and cakey peanut butter cookies are refined sugar-free and sweetened with honey. Here's a simple and scrumptious cookie recipe from The Little Big Book of Comfort Food. Featuring over 100 charming, full color vintage illustrations, this sweet little 350 page hardcover book would make a perfect gift. We're fortunate to have a local source for wonderful raw honey, and one of my goals is to start baking with this natural sweetener more often. As soon as I saw this recipe I knew I had to try it. What goes better with honey than peanut butter? These soft, cakey, not terribly sweet cookies taste even better the next day. This makes a small batch, so you may want to double the recipe. Ice cold milk is a must. I've been using ice cream scoops to portion out cookie dough since I started baking commercially back in (gasp) 1985, and have had some of mine for nearly as long. They effortlessly make perfectly shaped cookies, and are a very worthwhile investment. I have five or six different sizes; the scoop I used to make these is about 1½ Tablespoons and is similar to this one. Larger scoops, like this size and this size, are great for muffin batter and giant cookies, such as my Big, Soft, and Chewy Whole Wheat Chocolate Chip Raisin Cookies. I use a small scoop to make the Baby Chocolate Chip and Toffee Shortbread Cookies, and an itty bitty scoop makes darling—though slightly time consuming—mini cookies. A couple of heavy duty commercial baking sheets are a great investment, and once you try them you'll never want to use anything else. I use them for everything from baking scones to roasting brussels sprouts and have had some of mine for 20 years. As always, I urge you to use local and organic ingredients; they really do make a difference and often don't cost much more. We love Trader Joe's organic peanut butter, and it's just $2.99 a jar. Organic butter often goes on sale this time of year and freezes well for months, and organic flours are practically mainstream. Look for local honey and real farm eggs at the farmers' market. LocalHarvest.org is a great resource for finding locally produced food. 1. Heat the oven to 375°. Line a heavy duty baking sheet with unbleached parchment paper (you can use the same sheet for the whole batch of cookies). 2. Put the honey, peanut butter, butter, egg, and vanilla into a medium bowl and beat with an electric mixer on medium speed for 2 minutes (I use a hand held mixer). 3. Gradually add the flour, baking powder, and salt. Mix well. This is a very soft dough; I chilled it in the freezer for 20 minutes to make it easier to scoop. 4. Drop cookies onto the baking sheet, and then use a fork to gently press a crosshatch pattern into the top of each one. 5. Bake until lightly browned, about 12 to 15 minutes (a little less for smaller cookies). Transfer the cookies to wire racks to cool. Store in an airtight container or freeze. © FarmgirlFare.com, the soft and chewy foodie farm blog where Farmgirl Susan shares recipes, stories, photos from her crazy country life on 240 remote Missouri acres—and everything's better with cookies. This is my very favorite kind of cookie, and your version with honey look fantastic! Farmgirl, I love your blog, but I need to tell you that honey does *not* equate to sugar-free. Honey is 40% sucrose and 60% fructose. Just call the cookies: Honey Peanut Butter Cookies for truth in advertising. It is made by God's special workers and therefor Farmgirl is correct and I'm afraid that the truth is, you may have been a tad on the picky, i'm a know it all side. The truth is this is a honey based, sweetened cookie, and not a sugar based cookie. End of story. Now go make some, eat and be happy. I sure have and thank you Farmgirl they are awesome! Yummy! Once we extract some of our honey from the hive, we'll have to give this a shot. Actually, I'm allergic to peanuts so I'll try it with my homemade almond butter. I just love the combination of nut butters and honey! What a simple and delicious sounding recipe. Honey and peanut butter were made for each other! I try to bake with natural sweeteners as much as possible and I haven't made a peanut butter cookie in ages! I'll have to give these a try! Lovely and simple recipe. Thanks! As usual I so enjoy reading about your fun cooking adventures! I love your recipes, but this is my dad's favorite cookie, I'll have to whip up a batch when he comes to visit for the holidays! I've been a fan of Rumford's aluminum-free baking powder for years, and bought farm-fresh eggs from the farmstand all summer and fall -- they were fantastic! Really good! We added chocolate chips. I made this but used organic dark chocolate almond butter instead of peanut butter. As my 23 month old said, "Ummy!" I am so glad I found this recipe - I need to avoid cane sugar, so the honey is wonderful. I also must avoid wheat, so I substituted 1 can garbanzo beans for the flour. If you have any friends who cannot have gluten, please let them know it's an easy substitution and works well. I also used half the honey (only 1/4 cup) and used 4 T applesauce instead of butter. I love that I have a fairly healthy (low sugar, low fat, good fiber), really tasty snack. Our nieces and nephews agree! Hi there what temperature should I bake them with a conventional oven? 180? I don't like super-sweet things but love honey and peanut butter so I tried making these today... They turned out lovely! Thanks for the recipe! Just a quick question for you! Is your peanut butter sweetened as well, or is the unsweetened kind? It is so difficult to find recipes that are naturally sweetened. Thank you for this, they're delicious!! I just took the last batch out of the oven and gad my first taste. I love these cookies and my 16 month old granddaughter will love them as well. Her parents restrict her sugar intake always use natural sweeteners where possible. These will be a perfect treat for her at Oma's house. Than you for the recipe.